With a torque range from 10 up to 60 Nm, Giustaforza II 10-60 Pro is standard equipment of the best cycling workshops. Effetto Mariposa Giustaforza II 10-60 Pro Torque Wrench. With a torque range from 10 up to 60 Nm, Giustaforza II 10-60 Pro is standard equipment of the best cycling workshops. Design is inspired by smaller Giustaforzas, constructive quality and reliability are state-of-the art. The torque range of Giustaforza II 10-60 Pro is ideal for the elements of the bicycle with the highest torque specifications (bottom bracket, cassettes). In use, always refer to the torque values specified on technical documents or printed on the parts themselves. 1. Unlock the wrench-end knob by gently pulling it, and set the desired torque value rotating the knob and reading the torque on the scale. After setting the torque value, push the knob back in place, to prevent unwanted changes to the set value while using the wrench. 2. Depending on the rotation sense of the part you want to tighten, push the square section bar through the wrench head to one side or the other. 3. 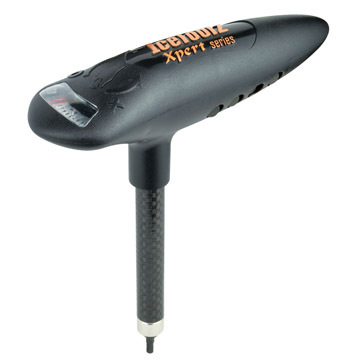 Using the tool, a loud ‘CLICK’ and a 3° free-movement tells when the torque has been reached. Reversible ratcheting head, 3/8″ square. Functional, linear in design and precise in any detail: shouldn’t be a surprise to know that Giustaforza II 10-60 has been conceived and produced in Italy. The tool has laser-etched inscriptions, and it’s built to last. The mechanical, click-type functioning make the wrench extremely shock tolerant and the absence of batteries or electronics, increase its reliability. Each sample is checked and numbered as a single masterpiece. From SLOWTWITCH of Valyermo, California on 8/1/2017 .